"Boy, I'm good. No wonder you love me." "Don't get a swelled head. I... uh... like you just a little, that's all." Nothing, not even the Triforce, has probably caused more speculation amongst the fans of Zelda, than the relationship between its two main stars - the hero and the princess. They've been thought of as lovers, friends, and sometimes, even sister and brother. However, there are some of us, who know that our favourite duo, look best together, in more than just a friendly sense. We believe, that Link and Zelda were always destined to be together. We are the Link and Zelda 'shippers otherwise also known as Zelinkers! 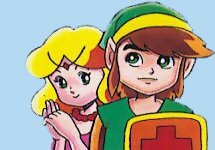 My favourite Link and Zelda generation, the originals, from the NES games back in the good old days, are not only the best in the series, but also, the generation that provides a wealth of evidence to back up 'shippers claims that they should be involved romantically. Though the games themselves sometimes prove little or give only little hints, the cartoon, books and comics from the same era contain plenty of proof that the duo love each other. The most fun thing about the cartoon was incessant (and sometimes pathetic) attempts at flirting with his beloved Princess, and Zelda's feigned denials. Even the comics and official mangas also allude to the fact that they fancied each other, and there's no denying this kind of evidence (since these were approved by Nintendo in the first place!). Of course I'm all for other pairings - Link and Zelda are simply my favourite coupling and I am in no way against people who think Link and Malon are right for each other, Link and Ilia, etc. The Link and Zelda pairing has brought about some wonderful fanfics and fanart and this page is here to celebrate their possible love for each other. I am not saying anything here is FACT, simply pointing it out as a suggestion or possibility. Have fun, and remember; even GANON agrees Link and Zelda are in love!! This is an UNOFFICIAL site and is in no way supported by Nintendo. The Legend of Zelda, Link, Princess Zelda, Ganon and other related characters belong to Nintendo. The images and information on these pages are purely for entertainment value only. This page was created by Juliet A. Singleton © 2001-2009. All rights reserved.